D = fdesign.isinchp constructs an inverse sinc highpass filter specification object D, applying default values for the default specification 'Fst,Fp,Ast,Ap'. D = fdesign.isinchp(SPEC) constructs object D and sets the Specification property to SPEC. Entries in the SPEC represent various filter response features, such as the filter order, that govern the filter design. Valid entries for SPEC are shown below. The entries are not case sensitive. Ast — attenuation in the stopband in decibels (the default units). Also called Astop. 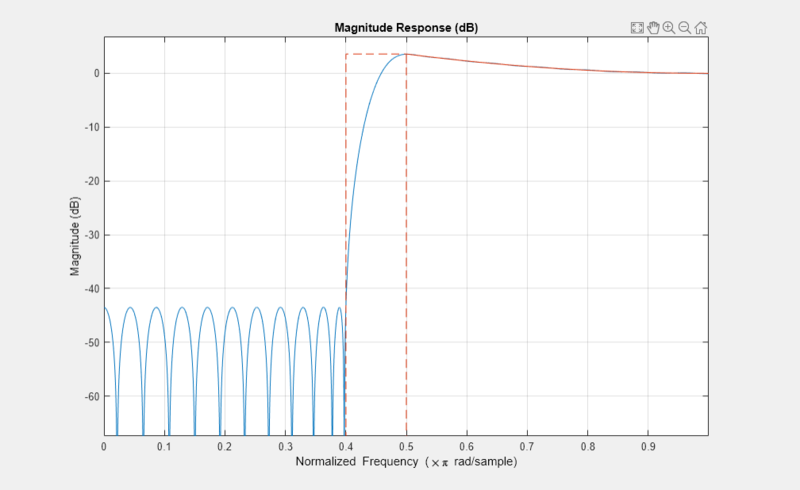 Ap — amount of ripple allowed in the passband in decibels (the default units). Also called Apass. Fp — frequency at the start of the passband. Specified in normalized frequency units. Also called Fpass. Fst — frequency at the end of the stopband. Specified in normalized frequency units. Also called Fstop. The filter design methods that apply to an inverse sinc highpass filter specification object change depending on the value of the Specification property. Use designmethods to determine which design method applies to a specific Specification. Use designopts to see the available design options for a specific design method. Enter help(D,METHOD) at the MATLAB® command line to obtain detailed information on the design options for a given design method, METHOD. D = fdesign.isinchp(SPEC,specvalue1,specvalue2,...) constructs an object D and sets the specifications at construction time. D = fdesign.isinchp(specvalue1,specvalue2,specvalue3,specvalue4) constructs an object D assuming the default Specification property 'Fst,Fp,Ast,Ap', using the values you provide in specvalue1,specvalue2, specvalue3, and specvalue4. D = fdesign.isinchp(...,Fs) adds the argument Fs, specified in Hz to define the sampling frequency to use. In this case, all frequencies in the specifications are in Hz as well. You can control the values of the sinc frequency factor, C, and the sinc power, P, using the 'SincFrequencyFactor' and 'SincPower' options in the design method. 'SincFrequencyFactor' and 'SincPower' default to 0.5 and 1 respectively. 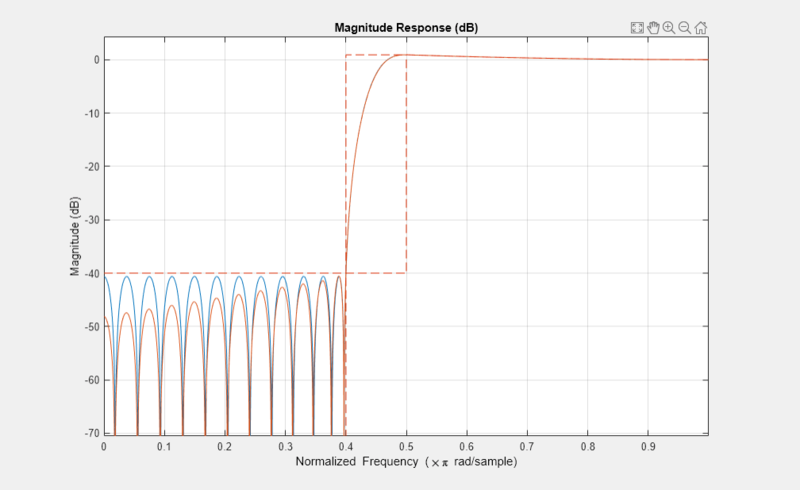 Design a minimum order inverse sinc highpass filter and shape the stopband to have a slope of 20 dB/radian/sample. Design a 50th order inverse sinc highpass filter. Set the sinc frequency factor to 0.25, and the sinc power to 16 to achieve a magnitude response in the passband of the form H(?) = sinc(0.25*(1-? ))^(-16) .